In our seemingly inexhaustible parade of Steam indie titles, we finally get to our first legitimate tower defense game. I’m frankly surprised that it took this long. Tower Defense is one of many genres that attract indie developers like flies to honey, thanks to its basic, addictive, casual premise that serves as such a ready framework for clever spins. 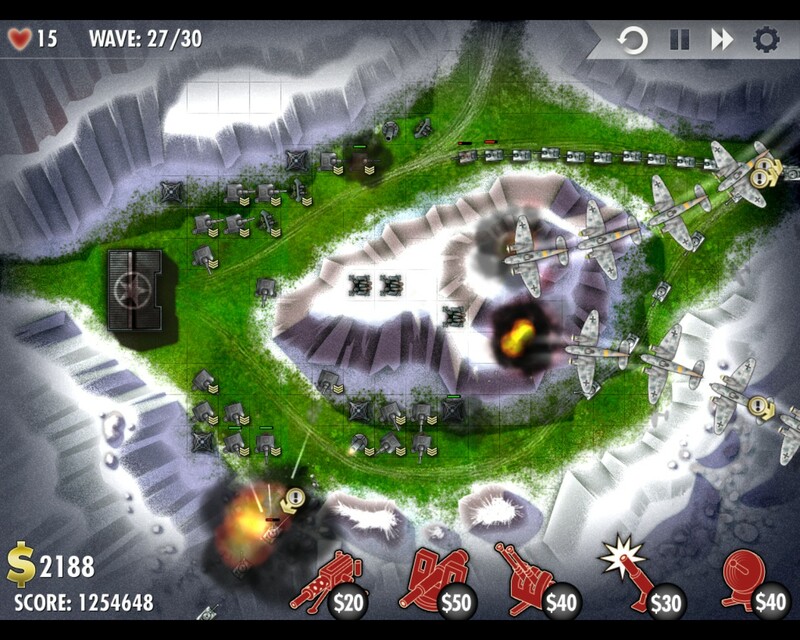 Chillingo’s iBomber Defense, rather than trying to slather on a layer of gimmick, went the “refine and improve” route. Let’s see how they did. 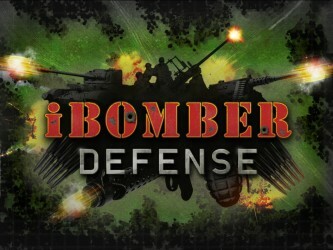 The actual in game graphics of iBomber Defense aren’t really anything special. They are good, certainly, but they don’t stand out. The setting is WWII, so the enemy variety is limited to assorted soldiers, trucks, tanks, boats, subs, planes, and bombers. A good job is done giving you a feel for the threat posed by each unit based upon the overall visual toughness. Likewise, the (mostly) static map looks fine, and makes it fairly clear where the paths are, laying down tire tracks and narrow passes on the ground and straights in the water. Weapon fire going to and from the enemies is well defined, and the size of the explosions or bullets scale appropriately with the damage. Faint grids are traced out to mark off where towers can be laid, and with a handful of exceptions they make it simple enough to plan out what goes where. Again, the graphics are everything they need to be, but don’t stand out in terms of style. Something that did stand out to me, though, was the UI. Menus are big, colorful, and easy to navigate. This is probably a carryover from its roots as an iPhone game. 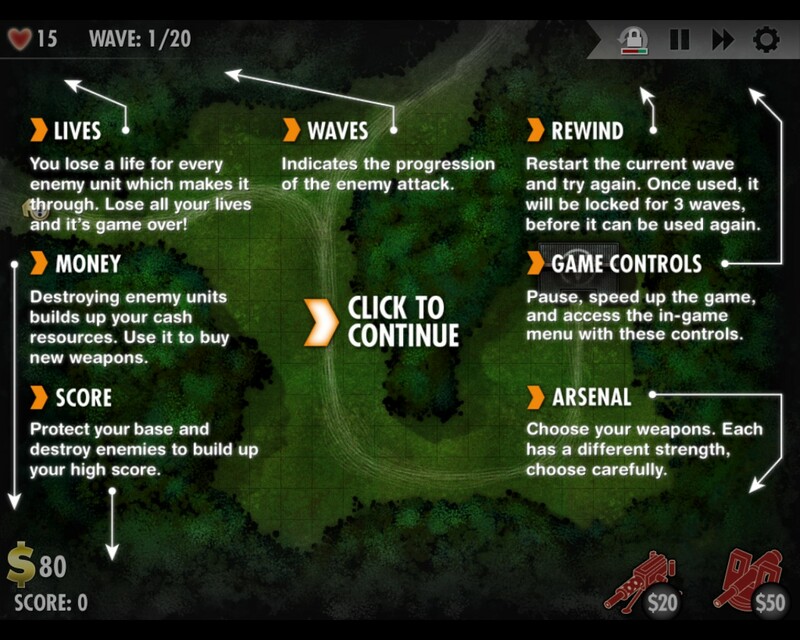 The informational portion of the screen is tucked away in the corners, out of the way of the action, and where there is menu animation, it is smooth and attractive. Little meters indicate health, with green labeling friendly units and red labeling foes. If an enemy makes it into your base, it flashes red. This was especially important in the later rounds, where things got extremely hectic, and it was easy to lose track of individual enemies under the dense clouds of cannon smoke. Even the rewind feature’s recharge is illustrated with a gradually filling meter rather than a count, making it a breeze to get the status of at a glance. You all know how to play a tower defense game. 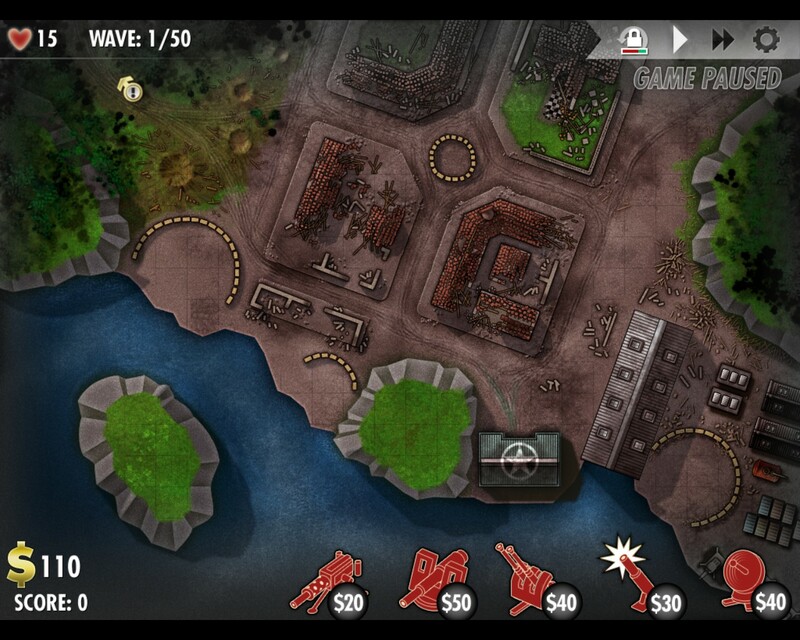 Enemies come at you in waves, you plop down towers of various types to prevent them from making it to your base. 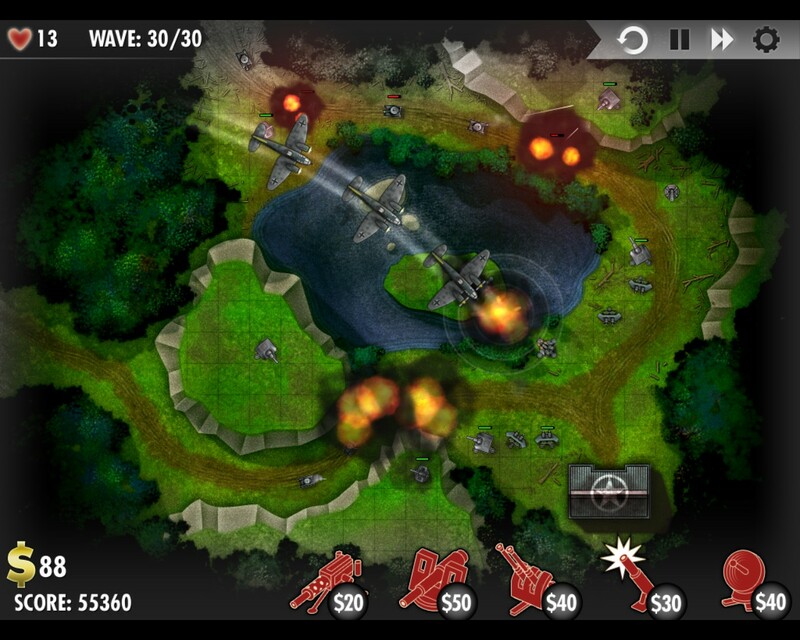 Some enemies are flying and must be taken down with anti-air, others are fast and should be slowed down. Let me just get the standard tower defense stuff out of the way first. Your weapons are machine guns, cannons, and anti-aircraft guns. In the role of “enemy speed reduction turret” is a the sabotage weapon, and one of the standard additions to the usual mix, the “range enhancement tower,” is played by the com tower. As is the case with many games, towers are upgradable, in this case to level 3, and in a pinch can be sold for a discounted price. Money is earned for each enemy killed, and some extra can be gained in the form of interest. 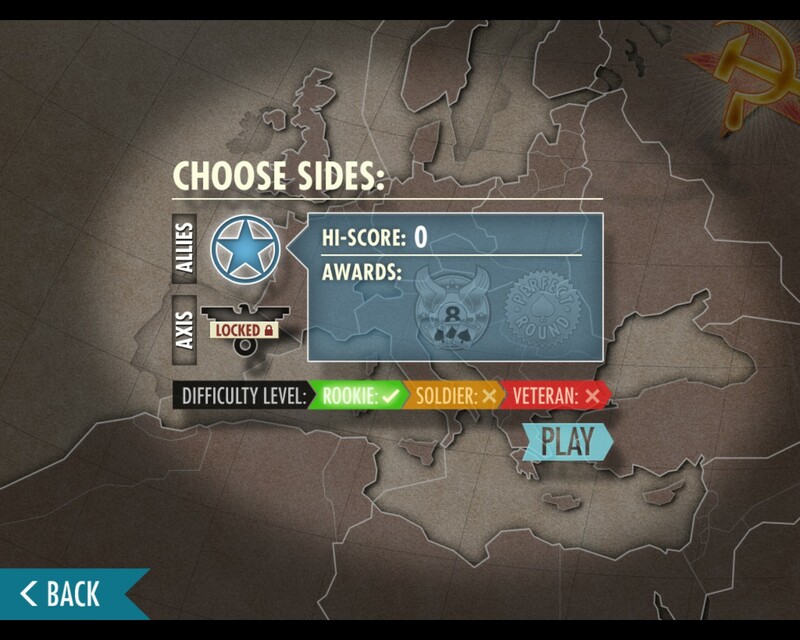 The exclusively mouse driven gameplay reveals its touch screen roots. Par for the course. Pour a dollar's worth of oil in that bullet hole, it'll be fine. Now for the interesting stuff. First, your towers aren’t invincible in this game. Enemy troops have their own firepower of varying degrees, so they will try their best to take down your towers as they march. In order to keep from having your precious defenses destroyed, you need to keep an eye on the battlefield and repair anything that gets hit. The initial cost of a repair is low, but it escalates quickly (decreasing the resale value of the tower along the way), so if you want to prevent huge expenses later, it pays to be quick to the repair button. It also helps to keep towers in good repair, since only a fully repaired tower can be upgraded, so if you need to upgrade in a hurry, it will take you at least one more mouse click if your tower hasn’t been taken care of. The placement of towers comes into play in an interesting new way, thanks to the potential to have your towers damaged. You see, certain enemies don’t have movable turrets, so they can only fire on towers directly ahead of them. Strategic tower placement will let you pound them with immunity. One feature of the game that I truly appreciate is the “rewind” button. It joins the standard issue fast forward and pause buttons in the corner, and allows you to turn the clock back to the beginning of a wave if things ended up getting more out of hand than you expected. Once used, it can’t be used again until a few waves pass, thus preventing you from taking too many mulligans in a row. If you do a good job on a level, such as achieving a flawless victory, you’ll get “victory points” which can be used to improve and unlock some of the deeper features of the game. 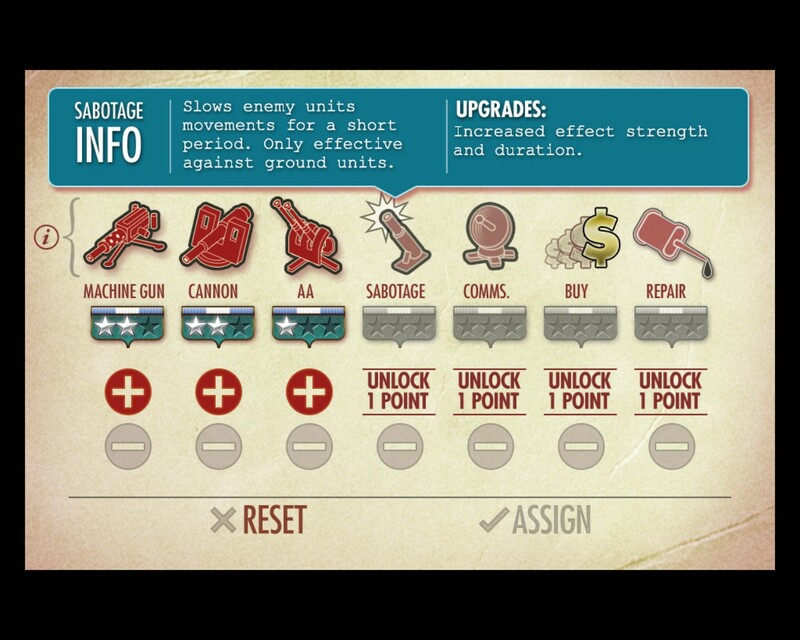 These will help you get higher levels of upgrade, and eventually useful things like the com tower and passive improvements, like an option that increases resale value and decreases repair cost. Basically, making it through a stage untouched isn’t just a personal challenge, it has tangible rewards. Every once in a while another curve ball is thrown at you, such as counter attacks. 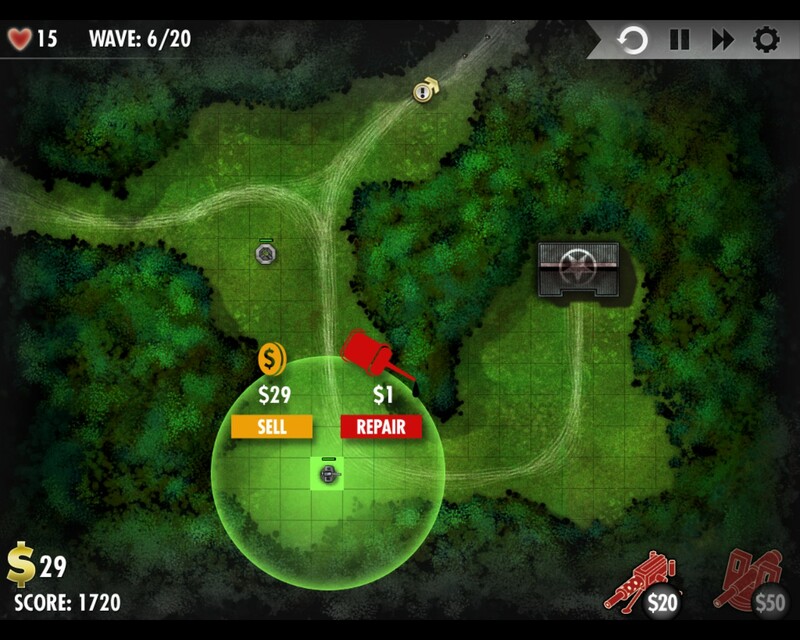 At the end of each section of the game, you’ll get a chance to revisit a previous level. 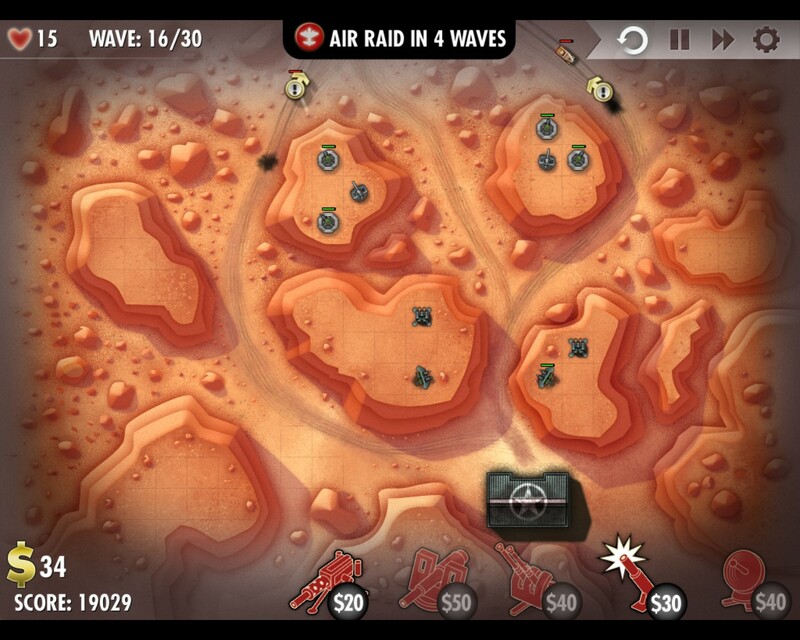 All of you towers will be where you left them, but a group of bombers will sweep through and carve a new path or two through the level, or eliminate a group of your towers and make their former resting place invalid for future placement. In extreme cases this can even happen DURING a stage as a surprise attack. 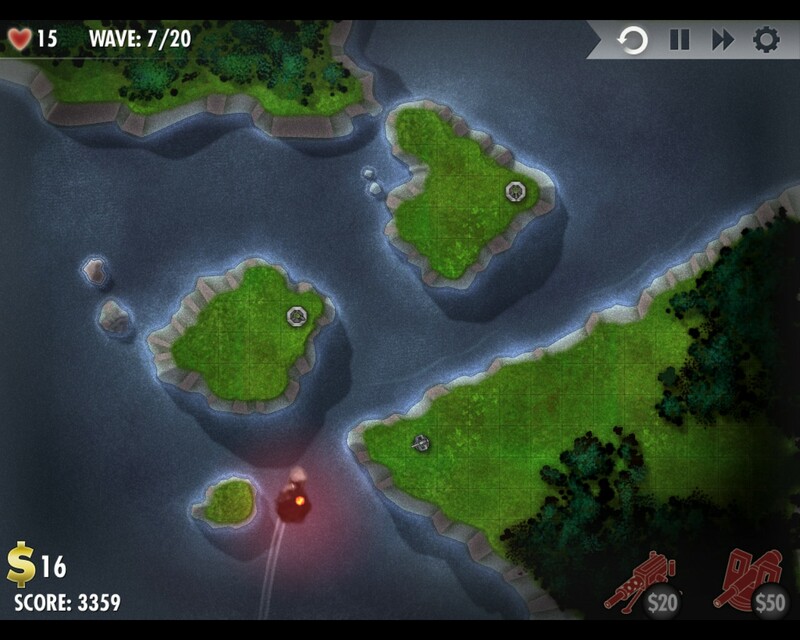 Considering the fact that the completely static nature of the map is one of the most taken for granted aspects of tower defense, suddenly finding that the enemies have a way to avoid your expertly crafted danger zone is unnerving. Hell, even before new paths are opened up, they tend to give you multiple entry points and multiple possible paths around the board, requiring a far more thoughtful placement of defenses to be sure they can’t avoid the lion share of your weapons. A final thing that I liked was that there is a roof on the amount of interest you can get per round. Many a time with other games I found myself purposely under arming myself so that I could build up a massive surplus of money, thus getting huge interest, then fill the board completely with weaponry once I was down to one hit point. 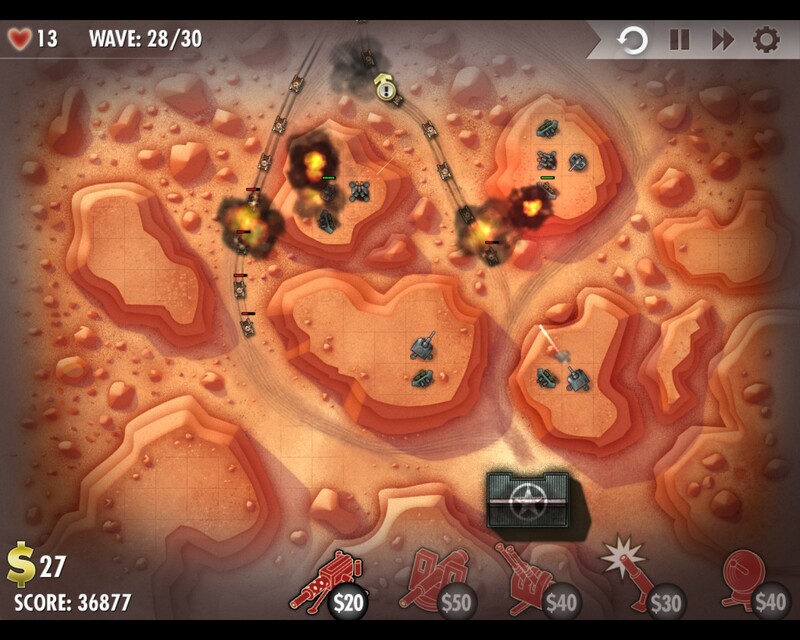 In iBomber Defense, once you’re getting the max interest, no reason not to dump the rest of your cash into firepower. To be fair, it is just them attacking you again. Probably should be "Re-Attack Bonus." The main campaign is set in a variety of different European locations, ranging from twenty or so waves early on to fifty toward the end. 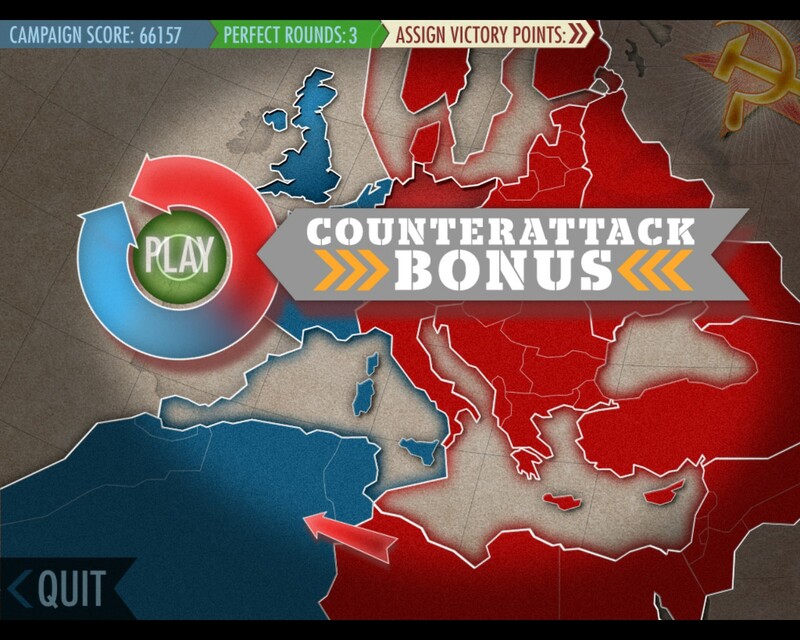 Once you’ve worked your way to Germany and finally declared victory, you get to play through again as the axis, rather than the allies. It is a nice way to double the length of the game, so this should last you a while, particularly if you are playing on one of the more difficult of the three difficulty levels and are interested in a perfect run. Boom, boom, BOOM, boomboomboom. That’s the sound in this game. There is very little music and very much explosion, particularly in the end game. Sure, there are engine drones for the planes and tanks, and different things make different sounds when they are hit or killed, but before long, you are hearing nothing but the relentless pound of cannons on boats, AA guns on planes, and machine guns on troops. Probably a fairly accurate depiction of a battlefield, but not exactly catchy. It isn’t a bad choice, but some of you out there may resort to playing with the sound off. Explosives are a key instrument of the soundtrack of this game. It is WWII. Your job is to pound the axis powers by, inexplicably, getting into their territory, establishing a base, then defending it until they run out of troops. I’m not sure that’s how warfare goes in real life, but hey, artistic license. 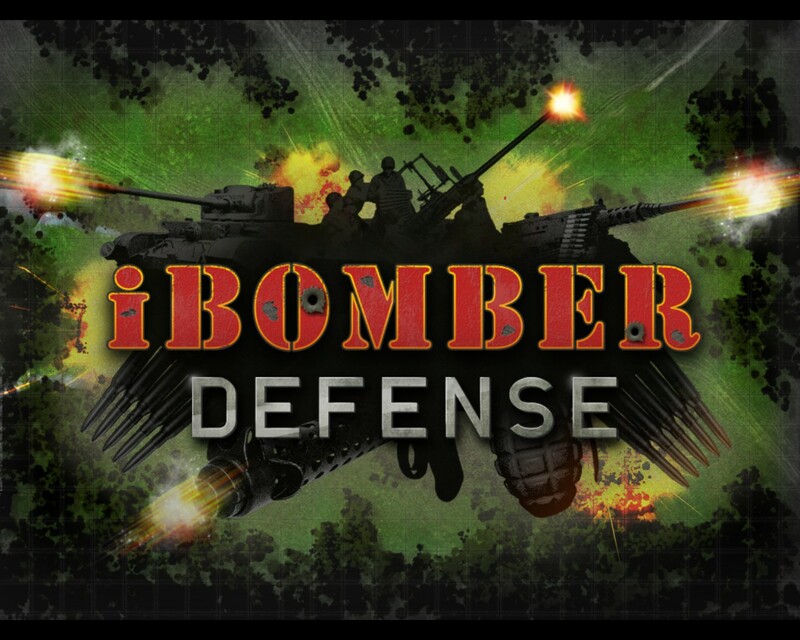 iBomber Defense takes the classic tower defense formula, strips away some of the more annoying bits, and throws in a few twists of its own. If you are looking for a decent TD title, this one fits the bill. 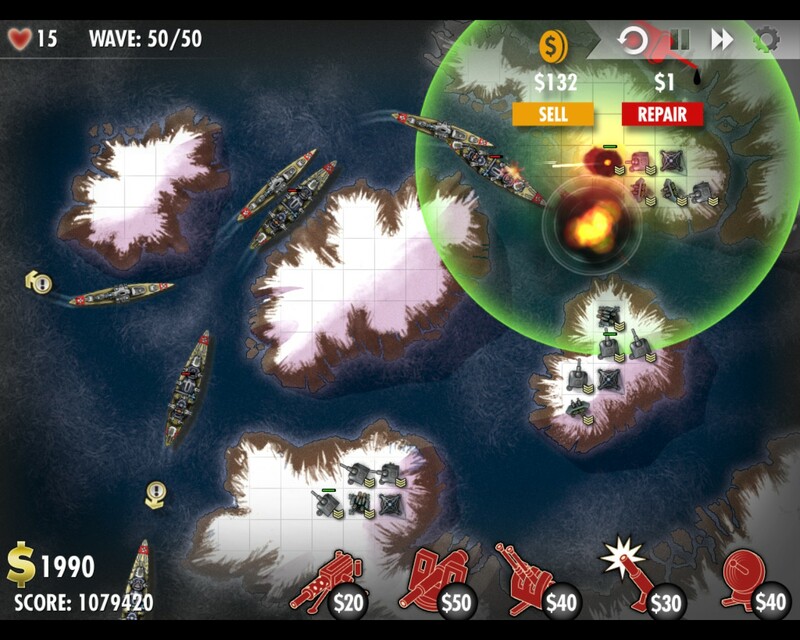 8.2 / 10: A slick and polished take on the old standby of tower defense. Pour a dollar’s worth of oil in that bullet hole, it’ll be fine.